Guru of Go protagonist Paul Westhead has been deeply influenced by the works of William Shakespeare. 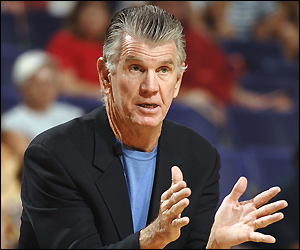 One of ESPN’s 30 for 30 series, the film focuses on Paul Westhead, the former coach of the Los Angeles Lakers who also drew nationwide attention, derision and acclaim for his frenetic, extreme hurry-up offense. The film spends the bulk of its time on Westhead’s Loyola Marymount years, during which time Hank Gathers and Bo Kimble led the Lions to national rankings before Gathers’ tragic on-court death in March 1990. Kimble and the team rallied to produce a tournament run for the ages, making it to the Elite Eight before losing to eventual national champions UNLV. Kimble paid tribute to his childhood friend by shooting, and sinking, the first free throw of each game left handed (A weak free throw shooter, Gathers had adopted the same practice his senior year.). As just about anyone who has followed Westhead during the past 30 years knows, the works of William Shakespeare have played an enormous role in Westhead’s life. The Philadelphia native who earned a Master’s Degree from Villanova, he has taught courses in literature at each of the places he has coached, from high school to college. In the film, director Bill Couturie signals the importance of the Bard on Westhead’s life, philosophy and coaching both by interspersing familiar Shakespearean quotes like Hamlet’s To be or not to be” into the work as well as having former players speak about Westhead’s quoting Shakespeare to them (This apparently worked for Kareem Abdul-Jabbar, but not for many of the college players.). I’ve read quite a few, but not all, of Shakespeare’s plays and sonnets-in high school I wrote a sonnet, recited it to a girl and tried without success to pass it off as my own-and Couturie’s film was a reminder to get back to the man who is arguably the greatest and most influential English-language writer of all time.